A unique Canadian textbook on civil procedure, it focuses on a narrative text, with each chapter devoted to a discrete topic of British Columbia civil practice and procedure. 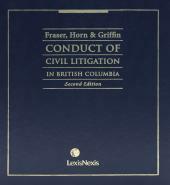 For over a quarter century, The Conduct of Civil Litigation in British Columbia, Student Edition by Fraser, Horn, and Griffin, has been a cornerstone resource for the litigation bar in British Columbia. With the feedback of law professors in B.C., LexisNexis Canada has created a new abridged version textbook for B.C. law students in civil procedure. 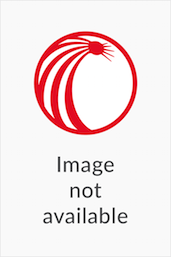 The Conduct of Civil Litigation in British Columbia, Student Edition – Student Edition is a comprehensive text on civil procedure with each chapter devoted to a particular topic of civil practice and procedure such as limitations, choice of procedure, deciding parties, service, motions, appeals, and much more. The Honourable G. Peter Fraser, LL.M. (Toronto), served as a judge of the Supreme Court of British Columbia since 1989 and served as Deputy Judge of the Supreme Court of Yukon Territory since 1991. He was Commissioner of the Law Reform Commission of British Columbia (1973-1982), served as a member of the Attorney General's Rules Revision Committee. Justice Fraser was Adjunct Professor at the Faculty of Law of the University of British Columbia (1980-1989), and has taught trial advocacy courses at the faculties of law at both the University of British Columbia and Osgoode Hall Law School. John W. Horn, Q.C., B.A. LL.B. (Cape), Associate Counsel at Ramsay Lampman Rhodes, served previously as Master of the Supreme Court of British Columbia (1989-2003). Mr. Horn has served as a Law Society Bencher, a Governor of the Law Foundation of British Columbia, Director of the Legal Aid Society and member and subsequently Chair of the Attorney General's Rules Revision Committee for 25 years. He has been Lawyer-in-Residence at the University of Victoria Faculty of Law, the Director of the Clinical Legal Programme at the University of British Columbia, and has taught numerous Continuing Legal Education courses in the areas of civil procedure and trial advocacy. The Honourable Madam Justice Susan A. Griffin, Q.C., LL.M. (University of London), J.D. (Toronto) is a judge of the Court of Appeal for British Columbia and the Court of Appeal of Yukon. She was a judge on the Supreme Court of British Columbia for 10 years. She practised civil litigation for over 20 years before the British Columbia trial and appeal courts, and she was a partner at Fraser Milner Casgrain LLP. She has her LL.M. from the London School of Economics and Political Science, University of London, and her J.D. from the University of Toronto. She is a frequent contributor to legal education seminars and has been contributing to The Conduct of Civil Litigation in British Columbia (LexisNexis Canada loose-leaf) since 2001.